The Three Witnesses of the Book of Mormon. 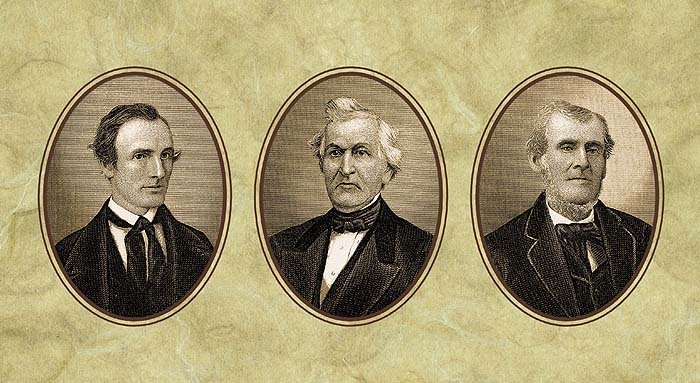 From left to right: Oliver Cowdery, David Whitmer, Martin Harris. A popular website designed to equip Evangelical apologists with information on Mormonism has a brief but highly flawed article on the witnesses of the Book of Mormon. It asserts, in so many words, that the witnesses' testimony of seeing and handling the Book of Mormon plates are unreliable for various reasons. Among the reasons given are 1) many of the witnesses were related to or friend with Joseph Smith 2) some of the witnesses claimed to see the plates only in vision with a subjective "eye of faith" 3) at least one of the witnesses claimed to have also been told by God to leave the Church, which presents a dilemma for Mormons because that same witness is said to have received that commandment from the same God who testified to him of the Book of Mormon and 4) the Witnesses were superstitious or gullible into believing things of a supernatural nature. It is beyond the scope of this post to ascertain the validity of all the arguments for or against the witnesses of the Book of Mormon. A considerable corpus of literature has been created on this subject, and the intrepid reader is to read some of those offers to see the different arguments on the two sides of this debate. However, as a believing and active Latter-day Saint and after reading much of the aforementioned literature, it is my conviction that the witnesses to the Book of Mormon not only are reliable but that it is more parsimonious to believe in their testimony as it stands than in the theories of critics of the Book of Mormon. For this post, I will therefore only focus on the offerings given on the website in question and will not focus on other specific criticisms by the likes of Dan Vogel or Grant Palmer. 1. The Book of Mormon Witnesses are unreliable or suspect because they are related to or in close association with Joseph Smith. This is a classic example of the logical fallacy known as argumentum ad hominem circumstantial. The premise of this argument is that the circumstances of an individual makes the individual "disposed to take a particular decision" and thus makes the individual and his/her claims unreliable. Therefore, this argument rests on "an attack on the bias of the source." However, such is a logical fallacy for the reason that the circumstances or bias of an individual does not negate the validity of their arguments or their testimony. Or, as wikipedia helpfully explains, "the reason this is fallacious in syllogistic logic is that pointing out that one's opponent is disposed to make a certain argument does not does make the argument, from a logical point of view, any less credible." To use a modern analogy, imagine a man named Stan Smith. 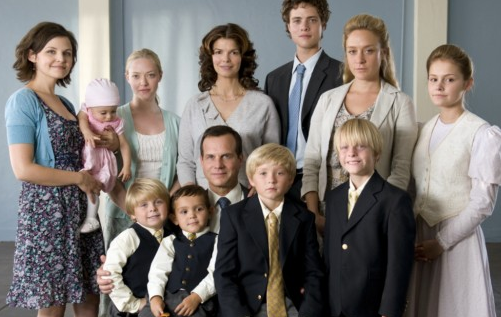 Mr. Smith is married with 4 kids, all of them adults. One evening Mr. Smith is gunned down in front of his family and some friends by an armed robber. When the robber is caught, the family and friends are called to testify as eyewitnesses to the crime on behalf of the prosecution. The defense, however, points out that the witnesses are immediate family and friends to Mr. Smith and thus they are unreliable witnesses because of their relationship with Mr. Smith. The defense argues that the close relationship of the witnesses, to use the words on the website, "raise the question about their level of discernment and their credibility as witnesses." See the problem with this line of reasoning? The relationship of the witnesses to Mr. Smith does not invalidate the fact that they witnessed the gunning down of Mr. Smith. The same applies for the Book of Mormon witnesses. The fact that the witnesses to the Book of Mormon were close associates or family with Joseph Smith does not invalidate their claim to having seen gold plates. If they really did see the plates, then their familial relationship with Joseph Smith becomes irrelevant. However, Evangelical Christians, like the proprietor of the website, need to also be careful in using this argument since the same argument was employed by Celsus, and early anti-Christian Roman philosopher, to try and invalidate the witnesses to Jesus' resurrection. Celsus opined that the close association between the Apostles who witnessed the Savior's miracles and resurrection invalidated them as witnesses. In short, their association "raise the question about their level of discernment and their credibility as witnesses." Celsus, in referring to the Apostles, inquired as to "what witnesses saw this wondrous event [i.e. the resurrection]... for I have only heard your voice, and have but your word for it." Celsus likewise asks "Who really saw [the resurrection]? A hysterical woman [referring to Mary], as you admit and perhaps one other person - both deluded by [the Savior's] sorcery, or else so wrenched with grief at his failure that they hallucinated him rising from the dead by some sort of wishful thinking." Thus, the same tactics used by this Evangelical critic are identical to the tactics used by Celsus. Both Celsus and the critic operating the website attack the validity of their respective witnesses on the bases of both their close association with Jesus and Joseph, respectively, and the subjective nature of their claims. Which brings us to number two. 2. Some of the witnesses said they saw the plates with the "eye of faith" and in a subjective spiritual setting, thus casting doubt on their credibility. This is a popular point of ridicule on some of the witnesses. Some of the witnesses, it is alleged, at one point described their seeing of the gold plates in seemingly subjective language. John Whitmer explained that he was shown the plates based on a "supernatural power" while Martin Harris said he saw the plates with an "eye of faith". Thus, according to the critics, this shows that the experience of both the Three and the Eight Witnesses was not based in reality but was subjective or purely visionary. However, there are some problems with this approach. For one thing, it ignores all of those instances in which the witnesses described their experience in real, concrete and physical language. John Whitmer, for example, explained in 1836 that he "had most assuredly seen the plates from whence the Book of Mormon was translated, and I have handled these plates, and know of a surety that Joseph Smith, jr., has translated the Book of Mormon by the gift and power of God." Other examples of this could be multiplied, as has been on the helpful FAIR wiki website on this matter. When Martin Harris said that he had seen the angel and the plates with his "spiritual eyes" or with an "eye of faith" he may have simply been employing some scriptural language that he was familiar with. Such statements do not mean that the angel and the plates were imaginary, hallucinatory, or just an inner mental image. But rather they were seen by physical eyes that had been enhanced by the power of God to view more objects than a mortal could normally see. Critics who insist otherwise do not provide their readers with all of Martin's statements, distorting the historical record. Critics impose their own interpretation on phrases that do not match what the witnesses reported in many separate interviews. When challenged on the very point which the critics wish to read into their statements—their literal reality—both Harris and the other witnesses were adamant that their experience was literal, real, and undeniable. From this and other sources we learn that the assertion on the website that the witnesses "all initially describe[d] their experience with the angel and the plates as subjective and visionary rather than objective and concrete" is not warranted from the historical sources. 3. One of the Witnesses, David Whitmer, said that God told him to leave the Church. He also said that if you believe his testimony of the Book of Mormon then you will believe his testimony out of the Church. If you believe my testimony to the Book of Mormon; if you believe that God spake to us three witnesses by his own voice, then I tell you that in June, 1838, God spake to me again by his own voice from the heavens, and told me to "separate myself from among the Latter Day Saints, for as they sought to do unto me, should it be done unto them." Critics of the Book of Mormon regularly point to this statement in an attempt to put the Latter-day Saints in an awkward position. After all, if one accepts David Whitmer's testimony of the Book of Mormon then one is going to also have to accept that God commanded David to leave the Church. As Brent Lee Metcalfe wrote, the Latter-day Saints "must confront Whitmer's challenge: believe that God confirmed the Book of Mormon translation and later instructed him to repudiate Mormonism or reject his testimony in toto. For Whitmer there was no distinction between the two experiences." Thus, when he reports being told by God to "separate himself from among" the members of the Church, Whitmer was already out of the Church, but still living in Far West among members of the Church. Whitmer's decision to leave Far West was arguably a wise one. Tensions were high, and there were threats of violence against apostates (including Whitmer, who had been very prominent) from people like Sampson Avard... Whitmer was not instructed to leave the Church or "repudiate Mormonism," he was instructed to leave Far West after he was already excommunicated. This was arguably a very prudent course, both for Whitmer's safety and the integrity of the Restoration witnesses. Believing Latter-day Saints have no trouble seeing both of Whitmer's revelatory experiences as inspired of God. While God would not force Whitmer to remain in the Church, He might well take steps to ensure that the Three Witnesses remained alive. In fact, Whitmer's fidelity to his testimony despite great disagreements with Joseph and the Church strengthen its force. Critics are dishonest if they imply Whitmer did not leave the Church until God "told him to." Thus, the critics do not have the Latter-day Saints in the airtight bind that they think they do. 4. The Witnesses were gullible and credulous when it came to supernatural matters. Could the Three Witnesses have been so caught up in the excitement that they imagined they saw an angel, or lied about seeing an angel to heighten the stimulation? An affirmative answer may suffice for testifying in the “heat of the moment,” but this explanation is not satisfactory when we look at the testimony that they continued to proclaim throughout their lives—through persecution, financial ruin, excommunication, embarrassment, and bitter-feelings. A testimony born in the excitement of the moment would die quickly under such adverse conditions. The witnesses were men considered honest, responsible, and intelligent. Their contemporaries did not know quite what to make of three such men who testified of angels and gold plates, but they did not impugn the character or reliability of the men who bore that testimony. Professor Richard L. Anderson perhaps knows more about the lives and the character of the Witnesses more than any other man on earth. He has written numerous articles and a book on the witnesses of the Book of Mormon and his research spans decades. When I spoke with Professor Anderson in person in December of 2008 at a conference sponsored by Olivewood Bookstore in Provo, I asked him if the witnesses, especially Martin Harris, were gullible or overly credulous about superstitious matters. Professor Anderson promptly explained that the only contemporaries of these men who thought they were gullible or easily duped were anti-Mormons with a high prejudice against the Witnesses. Others, both Mormon and non-Mormons alike, who knew these men personally knew them to be good, honest, industrious men of intelligence, sound minds and understanding. It can never be proved, or disproved for that matter, that Oliver Cowdery, David Whitmer and Martin Harris saw the plates. However, the historical evidence, in my view, supports the traditional LDS understanding of the Witnesses and the validity of their testimonies. The objections raised against the Witnesses to the Book of Mormon by this Evangelical website are, in my opinion, misplaced, misguided and wholly insufficient to explain away the Witnesses. They suffer from a general lack of scholarly and logical rigor and don't stand up to close scrutiny. For various reasons, as best explained by Professor Daniel C. Peterson, I find the testimony of these men to be strong evidence for the truthfulness of the claims of Joseph Smith. Whatever happened to those men, it was powerful enough to make Martin Harris exclaim "tis enough; mine eyes have beheld!" : This website is not to be confused with www.mormonwiki.com, which is a pro-LDS website. : The most pertinent works include; from an LDS apologetic perspective Richard L. Anderson, Investigating the Book of Mormon Witnesses, (Salt Lake City, Deseret Book: 1981); Richard L. Anderson, "Attempts to Redefine the Experience of the Eight Witnesses", Journal of Book of Mormon Studies 14/1 (2005), 18-31; from a critical perspective Dan Vogel, "The Validity of the Witnesses' Testimonies", in Dan Vogel and Brent Lee Metcalfe, eds., American Apocrypha (Salt Lake City, Signiture Books: 2005), 79-121 and Grant H. Palmer, "Witnesses to the Gold Plates", chapter 6 of An Insider's View of Mormon Origins (Salt Lake City, Signature Books: 2002). : Michael Ash has done an amiable job of summarizing the LDS arguments for the validity of the Witnesses' testimonies in his work Of Faith and Reason: 80 Evidences Supporting the Prophet Joseph Smith (Springville, Cedar Fort: 2008), 15-20. See also Michael Ash in Shaken Faith Syndrome: Strengthening One's Testimony in the Face of Criticism and Doubt (Foundation for Apologetic Information and Research, 2008), 193-200.
: Wikipedia entry under "Ad Hominem". Available online here. Accessed 6 June, 2009.
: Ibid. Christensen helpfully observes that "by way of modern parallel, the testimony of the eleven witnesses to the reality of the gold plates are discarded" based on the same standard used by Celsus. : See "Book of Mormon Witnesses/Eight Witnesses/Shown to Me by a Spiritual Power" on the FAIR wiki. Link here. : See "'Eye of Faith'/'Spiritual Eye' Statements by Martin Harris" on the FAIR wiki. Link here. : See "Book of Mormon Witnesses/ Spiritual or Literal?" on the FAIR wiki. Link here. : David Whitmer, An Address to All Believers in Christ by a Witness to the Divine Authenticity of the Book of Mormon (David Whitmer: Richmond, Virginia, 1887), 27-28. Ironically, anti-Mormons love to cite this work despite the fact that Whitmer emphatically and loquaciously affirmed his testimony in the divine origin of the Book of Mormon throughout its pages. : See "Book of Mormon Witnesses/David Whitmer Told to Leave" on the FAIR wiki. Link here. : Michael Ash, "Book of Mormon Witnesses, Part 1: Motives", FAIR Paper (FAIR, 2003), 2. Ash's series on the Witnesses, located on the FAIR website, offer another good overview of the LDS apologetic views on the issues surrounding the Witnesses. : See "Book of Mormon Witnesses/Character" on the FAIR wiki. Link here. : An mp3 version of Daniel C. Peterson's excellent "A Tangible Restoration: The Witnesses and What They Experienced", is available for download from the FAIR website. Interesting article. I think the bigger issue not addressed is the fact that none of the witnesses were experts in "reformed Egyptian" and therefore none could make a credible claim about the authenticity of the translation. A person who does not understand German is not a credible witness that I performed an accurate translation into English. A claim such as "I had most assuredly seen the plates from whence the Book of Mormon was translated... and know of a surety that Joseph Smith, jr., has translated the Book of Mormon by the gift and power of God" is not credible. One cannot claim the plates were the source of the translation if one cannot independently verify an actual and accurate translation took place. Likewise one cannot claim the translation was done by the 'gift and power of God' when that person cannot independently verify the source and accuracy of the translation. Since no one outside of Smith has been able to translate "reformed Egyptian", there can be no credible witnesses. I think that a number of things corroborate the witnesses' testimony. The first is that the Three and Eight Witnesses testimony compliment each other. Without the Eight Witnesses, who do not describe their experience in any sort of supernatural language or terms, the Three Witnesses could be dismissed as delusional or visionary. But the Eight Witnesses cannot be dismissed as such because they don't describe any spiritual activity; just seeing plates. Likewise, remember that the Three Witnesses are the ones who said Moroni declared the translation correct, which would compliment the Eight Witnesses who, as you point out rightly, had no way of confirming the ancient origin of the plates they were holding in their hands. Does that make sense? The two sets of testimony go together. Likewise, remember that the Eight Witnesses' signed testimony say nothing as to the accuracy of the translation. Simply that they handled the plates. I think that the Eight Witnesses therefore received confirmation of the accuracy of the translation by other means, be it personal revelation or relying on the Three Witnesses' testimony which does say that Moroni declared the translation true. I do believe that Rob's comment represents a serious lack of knowledge in relation to the "translation" process. It is not as if Joseph knew "reformed Egyptian" either nor was the text of the Book of Mormon produced via a handy "reformed Egyptian" grammar and a set of gold plates. And interestingly, the witness statements in the 1980 edition do not include anything to the effect that the translation was "authentic." Merely that "the work is true" or that "these things are true." They base their assessment on what God told them, not upon any knowledge obtained through intellectual inquiry. If God appears to you and says, "I command you to bear witness of this book. It is a record of ancient peoples and the translation is altogether correct" what precisely are you going to do? It would appear that Rob would respond "Hang on a mo' there, if you would just provide me a reformed Egyptian grammar so that I can check the translation myself then I can be sure it's truly reliable and bear witness of that." The phrase "Thou shalt not tempt the Lord thy God" springs to mind. Regardless of the divine assurance they are relaying these men actually saw and held the plates. Early on, previous to his experience as a witness Harris had opporuntity to heft the plates although he was not allowed to see them, he noted that the plates were either lead or gold and he knew that Jospeh did not posess the funds to buy even a sufficient quantity of lead. And precisely how did Joseph some up with the Urim and Thummin, the Sword of Laban, and the Liahona? These were actual items, things they beheld and handled. Even if he could have slipped the three of them a bit of peyote whereby they halucinated angels and voices from heaven we are left ask how he ever managed to fabricate these wonderful artifacts. And remember, there is nothing supernatural about the testimony of the eight witnesses. They provide in concrete terms the experience of handling the plates. It wasn't a block of lead. It looked gold. There were individual leaves. There were "engravings" on the leaves and they had "the appearance of ancient work" and "curious workmanship." The facile "You need to be an expert the render and expert opinion" is not only unconvicing, it's irrelevant. They were relaying an expert opinion, not independantly declaring one. They could certainly do that much quite admirably. I would assume that if one believes in God one would consider His opinion on the accuracy of a translation sufficient.